This course is for the expert user who has good experience with Microsoft Excel or has completed the five courses in our Beginner Series plus Expert Level 1, 2, 3, 4 and 5 classes. 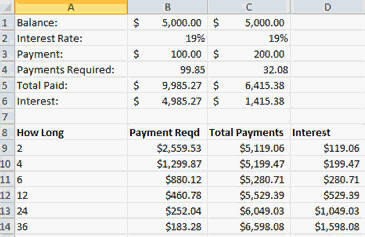 This course will teach you how to work with financial functions in Excel. We will begin by learning about Excel's financial terms and functions including PV (present value), FV (future value), PMT (payment), RATE (interest rate), and NPER (number of periods). You will learn about APR (annual percentage rate) and simple vs. compound interest. Next you'll build a loan calculator where you will use the PMT function to determine the monthly payment for a loan (home mortgage, car loan, etc.) 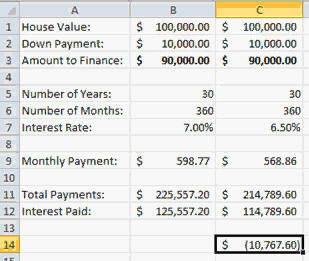 knowing the value of the loan, interest rate, and term of the loan (years). 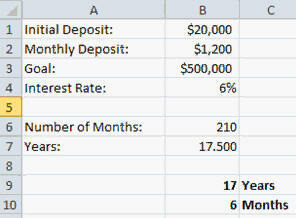 We will be able to examine multiple scenarios by adjusting the variables to determine the best loan for our needs. In the next lesson, we'll build an investment calculator. If you deposit money into an account and have a set APR, we'll calculate how much money you'll have in your account after so many years. We'll use the FV (future value) function for this. Next we'll build an interest rate calculator. If you know your initial deposit and the current value of the investment, you can use the RATE function to calculate your return on investment. 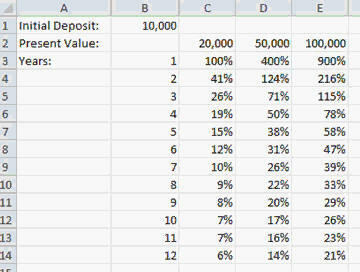 Next comes a fun project I like to call the millionaire calculator. You can use this to determine how long until you become a millionaire. 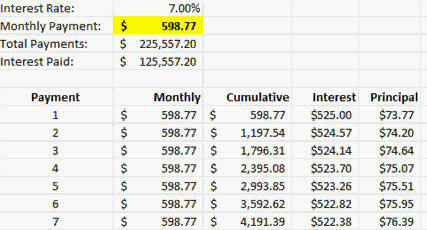 Or, if you only want to save, say, $500k for retirement, this spreadsheet will tell you how long it will take. You input the initial deposit amount, the amount you're going to pay into the account every month, your goal amount, and the interest rate. The NPER function will tell you the number of periods (months or years) until your goal is met. This is great for calculating the time until you can retire. 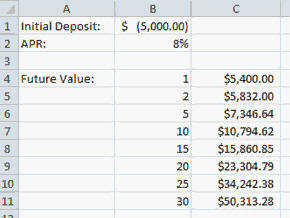 Next comes the initial deposit calculator. Knowing the current balance of an account, the interest rate, and how long the account has been open, you can calculate what the initial deposit was using the PV function. Along the same lines, you can also use the PV function to calculate how much house you can afford when you go home shopping. If you know what monthly payment you can afford, what your interest rate is going to be, and how many years you want a mortgage for, the PV function can tell you how much house you can afford to buy. Next we'll learn how to build a loan amortization schedule. We'll look at one of Microsoft's templates to see a good example, and then we'll actually build our own so you understand all of the functions involved. You'll learn about the IPMT and PPMT functions which can calculate how much of a monthly payment is interest and principal, respectively. You'll also use the CUMPRINC and CUMIPMT functions to calculate interest and principal between any two points in the loan. Finally, we'll take a look at your credit card statement. We'll use the NPER function to determine how long it will take to pay off your credit card debt if you just make the monthly minimum payments. Then, we'll use the PMT function figure out how much you'll have to pay every month if you want to pay off your debt in, say, 6 months, a year, or 3 years. You'll see how much the credit card companies are REALLY making off of you! Again, this is the perfect class for anyone who wants to learn how to work effectively with financial functions in Microsoft Excel 2010. Of course, if you have any questions about whether or not this class is for you, please contact me. 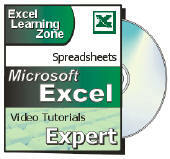 Richard on 6/8/2011: The focus of this course is working with financial functions in Excel. Topics covered include: - Financial Terms & Functions - PV, FV, PMT, RATE, NPER - Loan Calculator with Multiple Scenarios - Investment Calculator with Multiple Years - Interest Rate Calculator with ROI - Millionaire Calculator - Home Value Calculator (how much house?) 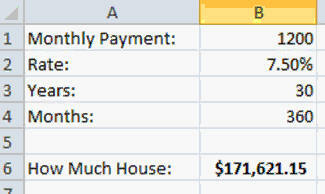 - Loan Amortization Schedule - Credit Card Payoff Calculator - Lots More! Ramesh on 6/14/2011: how to learn VBA Macro in excel???? Macros will be coming up in the Advanced series. VBA will be in the Developer series. Look for both of them later this summer. PMT function in cell B9 return with a negative number (-598,77), and Cell B11: show the amount of 205.558.01. When multiplay Cell B9 with -1 in order to get a positive number in Cell B9 and B11 respectively does cell B11 change amount to 225.558.01. The same appear in your example and the same happen in my spreadsheet as well. Thanks for an excellent course. Joe Beniacar on 4/28/2014: Hi Richard, if the Interest Rate is 7%, shouldn't they have to pay an additional (.07)(90,000) = $6,300 per year, rather than ($598.77)(Monthly Payment) (12) = $7,185 per year? Thanks! with Column 1 just AutoFilled down, Column 4 being a bunch of 100's, Column 2 starting at 5000 in Period 0 and for each subsequent period doing = the previous period's Plus Interest - the current period's You Pay (100), and Column 3 being =Total+(Total*(Rate/12)), you only get 59 months, rather than 99.8. Can you explain why this method doesn't arrive at the same result as the NPER formula? i.e. 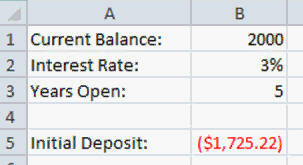 Is the notion of adding the Interest to the new Total (after removing the previous 100) incorrect? Thanks a lot for clarifying that! Anonymous on 4/29/2014: Hi Richard, would you be kind enough to make an Advanced class covering the more complex financial functions, related to Bonds, Annuities, Depreciation, etc? That could be pretty helpful. Thanks.